Posted January 10, 2013 in kinetics. For me, one of Kirby’s most visually inventive stories of the 60’s appeared in Fantastic Four #76, with a July 1968 cover date. The story was entitled, “Stranded in Sub-Atomica,” wherein the group followed the Silver Surfer into a microscopic universe. Of course, the FF had been down that road before when they had faced Dr. Doom in issue #16, but this story appeared to take more than a bit of its inspiration from the 1966 Sci-fi film “Fantastic Voyage.” Although the film follows a mission of miniaturized scientists inside a human body, it still focuses on the nature of a microscopic world revealed as the scientists explore their biological universe. 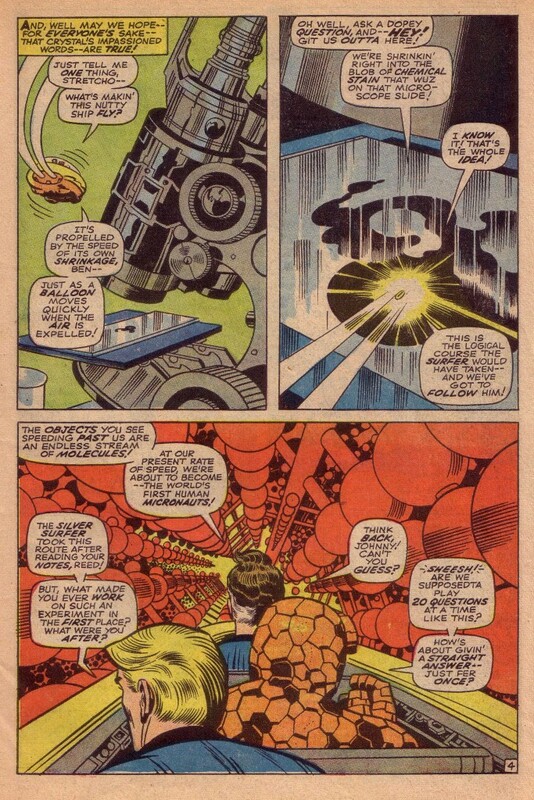 In the case of the comic book, Kirby and Lee’s story gave the King license to dream up an incredible series of landscapes that only an artist of his caliber could execute, starting with page four below, wherein they fly their ship into a microscope’s slide and enter a stream of molecules. 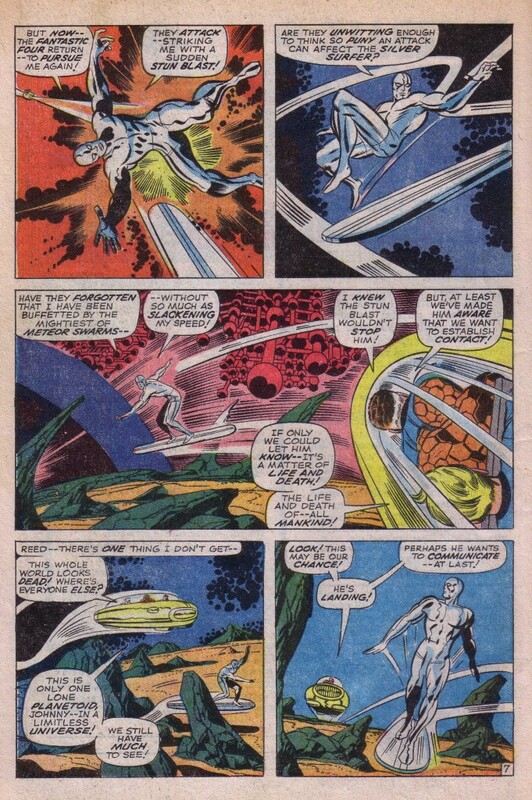 This third panel is a fairly simple composition, as the molecules recede before the “micronauts”, giving the frame a wonderful sense of deep space, something that Kirby has mastered after years of presenting dynamic multidimensional compositions on two dimensional surfaces. The panel is a entry into a 60’s era psychedelic dimension of Kirby phantasmagoria. which explodes in our faces on page six shown below. Here, they encounter the Surfer, exploring the weird new world, zipping deftly around an obstacle course of molecular structures that somewhat resemble tinker toys designed by Bucky Fuller. There are liberal amounts of Krackle as well, weaving together Kirby’s sub-atomic dream-scape. The Surfer spreads his arms wide like wings, as a free soaring bird would, exulting in the freshly discovered limitless expanse of inner space. 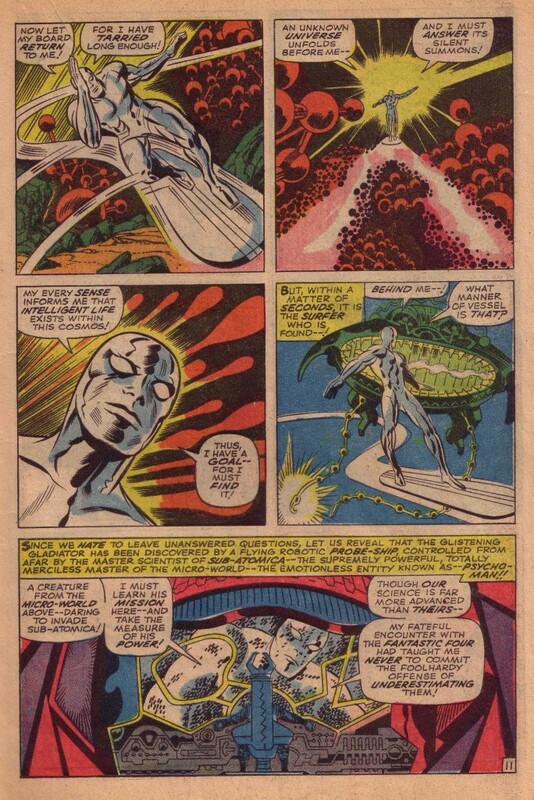 The following page above continues the excitement as the Four attack the Surfer with stun blasts. This is a nice sequence where the latter is knocked from his board in panel one and rights himself immediately in panel two. The sweep of the board in that panel leads the eye to panel three where the Surfer is swooping across a rocky terrain with more masses of molecules suspended in the alien atmosphere. 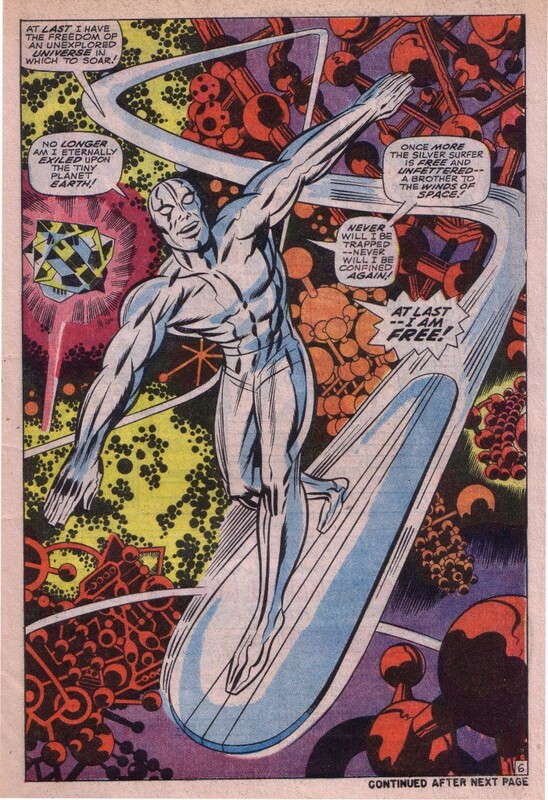 Kirby masterfully repeats the elongated oval shape that comprises the surfboard with the FF’s ship as well. At some point, the Surfer tires of the conflict and flies off. The second panel of page eleven is a splendid shot of him receding into the distance, his speed and momentum underlined by the artist’s use of molecules on the borders of the panel pointing the direction forward. Kirby then cuts to a neat head-shot framed by energy bolts, just before the Surfer encounters Psycho man. The villain’s ship looms behind the hero like a predatory creature, and the story veers of into another direction. This story is yet another clear example that Kirby was always keeping his eyes and his hungry mind open to new ideas. Although obviously not literally a child of the sixties, the King’s vivid and boundless imagination blossomed in that era of mind expansion and blossoming visual and spiritual creativity.